Theresa Howell began her career in publishing as a children’s book editor at Rising Moon, where she helped to establish the bilingual imprint Luna Rising. She is the author of several children’s books with an artistic and cultural focus. Visit her at theresahowell.com and on Twitter at @theresaahowell. Rafael López grew up in Mexico City, where he was immersed in the rich cultural heritage and color of street life. 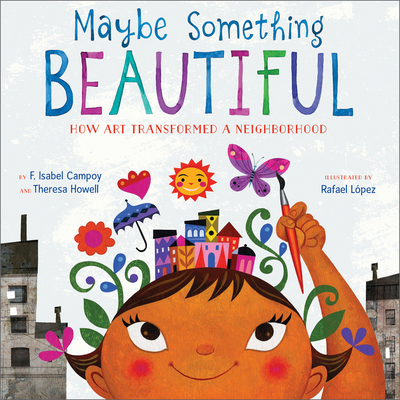 He is the illustrator of many vibrant picture books, including the acclaimed Drum Dream Girl: How One Girl's Courage Changed Music by Margarita Engle and Maybe Something Beautiful: How Art Transformed a Neighborhood by F. Isabel Campoy and Theresa Howell. He has received the Pura Belpré and Américas awards multiple times. Rafael Lopez also designs and creates community-based murals nationwide. He divides his time between San Miguel de Allende, Mexico, and San Diego, California. Visit him at rafaellopez-books.com. * "An inspiring and wistful message wrapped up in a subtle, thoughtful narrative and lively, beautiful art: simply superb." "...Campoy and Howell deliver a clear, uplifting message about the power of art to revitalize people and their surroundings." "This empowering story of community engagement might inspire kids to get involved in their own neighborhoods."